VECAL - VCOrganizer syncs Outlook with Android phone and tablet. 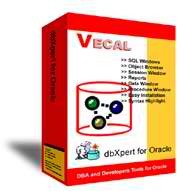 dbXpert for Oracle is an easy to use database development and administration tool for Oracle database. It helps developers and DBAs get the job done quickly and efficiently. dbXpert for Oracle provides an integrated environment to speed PL/SQL development and testing. It also provides an easy way to access the database objects. With the help of dbXpert's intuitive graphical user interface, developers can focus on coding quality application programs while DBA can be more interactive and productive when troubleshooting and administrating the Oracle database. SQL Editor enables users to quickly test queries, view and edit data, and process SQL DML/DDL commands. It replaces the traditional command line query and script execution facility with a graphical user interface. Multi-Tabbed Working Panel - execute and edit multiple SQL statements in separated document with separated resultset. Multiple Split View - allow user to split the editing window into 4 separate views. Multi-Query Resultset - select multiple statements and run in one go. The resultset will be displayed separately. Powerful SQL Editing - SQL Synatax Highlight, Alternate Row Colors, Regular Expression Search, Column Selection and Manipulation, SQL Formatting, Keyword Case Normalization, Unlimited Undo/Redo, Bookmarks, Incremental Search, etc. SmarTab - displays keywords, table name and column name with popup windows, and auto-complete partially typed identifiers. SmartLink - type SQL script name (shortkey) to execute the SQL stored in Script Library. QuickSearch Toolbar - you can select the SQL from the "SQL" dropdown box to goto the statement in the workspace directly. Query Builder - make it easy to create new select statements. Master Detail Browser - make it easy to view data in master-detail structure. Direct Data Editing - direct data edit in the resultset, which includes LOB, Nested table, and Object, PL/SQL cursor etc. Quick Object Browsing - you can press Ctrl-D to describe object in the workspace. Quick Record Browsing - you can press Ctrl-Q to list the records of the table in the workspace. Execution Logging - log all the executed statements in log files, including the execution results and bind variable values. Export Records - export records of the resultset to Clipboard, text files or Excel files. Support Unicode - Characters - you can view records or execute SQL statements with Unicode Characters. Favorite Workspaces - store the frequently access workspaces. Multi-Threaded SQL Execution - You can run multiple windows concurrently. Others - SQL Execution Plan, Session Statistics, execution history, DBMS_OUTPUT, SQL Tuning Advisor, etc. The Intelligent Data Browser allows you to easily access your data in the database. You can easily retrieve data, filtering data or editing data with a fancy user interface. The Query builder provides you the fastest way to build a complex query which involves multiple tables by "drag and drop", to add filtering conditions by clicking the value in the result panel. The query can be saved and you can quickly access the frequently used query using the Recent Queries menu. The popup menu in the resultset allows user to quickly perform record filtering. It's content sensitive menu displays filtering critera based on the content of the selected cell. Display the content of bind variables, including LOB, PL/SQL cursor, Object etc. PL/SQL Profiler allows developer to quickly identify the performance bottleneck. The dbXpert PL/SQL debugger offers all features of debugging functions that allow developers to easily debug the PL/SQL program units. With the PL/SQL debugger, you can Step In, Step Over, Step Out, Run To Cursor, Set Breakpoints, View Variables, View Call Stack, and so on. dbXpert for Oracle - Instance Performance provides generalized key performance indicators (KPI) for the instance to which you are connected. It provides a look at database resources, instance service time, recent activities, top session, session history, top sql and instance throughput. 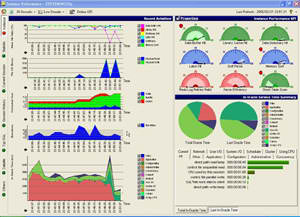 Database administrators can easily monitor the health of various components in the monitoring instance. Application developers can also make use of this tool to diagnose and correct Application performance problem. DBA and Applicaiton Developer can use the Session Window to view the current activities of each user in the database. They can check the resource usage of individual user, statistics information, objects that being locked and even the current running SQL of each individual session. To run reports against your application data or against the Oracle dictionary, you can use dbXpert's built-in Report functions. There are more than 40 standard reports such as user security reports, database summary reports, application performance reports or even database maintenance reports. These reports can be saved in a report file as HTML format, preview, print or publish to your web server for information sharing. dbXpert includes several tools to make everyday administration and development easier. You can recompile invalid objects, create database objects, drop database objects, export records of tables or view, monitor session activities, manage users, manage storage and so on. The TOP SQL Window allows DBA to identify the problematic SQL Statements in the database. The problematic SQL running in you database may impact the performance of your system and slow down end user's response time. The problematic SQL can be sorted by number of executions, number of buffer gets (CPU contention), number of disk reads (I/O contention) etc. It also shows the summary of performance statistics of each individual SQL statement. DBA can also view the execution plan of the SQL statement and the performance statistics of the objects that being accessed by the SQL statement. 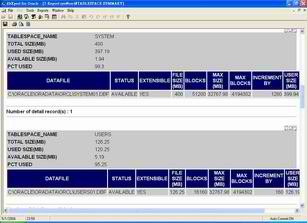 With the Manage User Window, DBA can create, edit, delete, disable or enable any user account in the database. DBA can use this tool to assign roles, system privileges, object privileges, and tablespace quota to user. DBA can use the Manage Storage Window to create, delete or edit the storage objects in the database such as Tablespaces, Datafiles, Redo Logs, Rollback Segments, Archive Logs etc. The Manage Storage Window also shows the storage summary of each type of storage objects such as the size of tablespaces, remaining size of tabelspaces, sizeof datafiles, and status of these objects. When developer needs to understand the table relationships in an applicaiton with no assistance of any written document, Record Search can help to show all objects that contain one particular data value by searching the entire database. The search result shows how many records in the tables containing the value that been searched, it also highlights the columns that contain the target value. dbXpert comes with pre-configured color themes. It allows user to set different color themes based on the connection alias and login user name. It's very useful for DBA and developer when they need to work on multiple environments. Neither database object installation, nor any middle-ware required, only SQL*Net is required to pre-installed. The installation can be completed within 30 seconds, by just simple clicks. You can run multiple windows concurrently. The IDE will not "hang" even if you make any error or your session is being locked. UNIX or Window based server.